Ceremony with the reading of Psalm 110. “In 1997 AKi was already working towards the 150th anniversary celebrations of Trinity congregation in 2003. The group was disturbed by the discrepancy between the significance of Pastor Herlitz for our congregation and the desolate state of his memorial. This shared the neglected fate of many of the memorials you see around you. The memorial had sunk somewhat, the stone was discoloured, the stone plaque had fallen and split into three pieces, the wrought iron fence was rusty and bent and the gate wouldn’t close. AKi decided to make the restoration of Pastor Herlitz’s grave one of its projects. There are a number of names to mention in relation to the restoration. In 1999 Herbert Mees, AKi chairman, approached Dr Celestina Sagazio, National Trust historian with a special interest in cemeteries and famous for her full-moon tours of the Melbourne General Cemetery. Dr Sagazio offered the assistance of the Trust and directed us to Helen Lardner, conservation architect, who gave us a detailed report on the sympathetic restoration of the monument. A quote was obtained, but it proved financially impossible at the time to pursue the project. In 2009, however, the church committee approved the project. We are grateful to the committee for their support. Herbert Mees and Dieter Steiniger were AKi members especially involved with the project. In particular, Dieter Steiniger devoted a lot of time and effort to co-ordinating the project. A quote from the firm Cathedral Stone, recommended by the National Trust, was accepted and the work carried out last year under the direction of Jamie McAuley to effect the excellent results you see here today. Herbert Mees then presented the following talk about the life and times of Pastor Herlitz: “In presenting this short biography of Pastor Herlitz, I wish to acknowledge the research by Drs Walter Phillips and Raoul Middelmann and the late Professor Dr John Martin. Much of the substance of this paper is based on their chapters in the book A German Church in the Garden of God. We have come here today to honour the memory of a man who takes his rightful place among the ranks of eminent Australian Lutheran church leaders of the second half of the 19th and the early years of the 20th century. His tireless efforts to bring about Lutheran church union in the face of many difficulties helped pave the way towards the formation, many years later of the Lutheran Church in this country as we know it today. In relation to his family background education, occupation, Hermann Herlitz was born on the 10th of June 1834 in the Prussian Province of Silesia in the town of Neisse, now Nysa in Poland. He was the son of Jewish parents. Parallel to his primary and secondary school years, he received instruction in the Jewish faith and in the Hebrew language. Following his school education, Herlitz completed a commercial apprenticeship. Over the next six years, he worked as a clerk, bookkeeper and salesman for several wholesaling and manufacturing firms before he decided to go to London and set himself up in business. The move to London spelt disaster for his business plans, but it became the turning point in his life. Dispirited and looking for direction, Herlitz came across a Christian organisation in London doing missionary work among Jewish people. This influence led to his conversion to Christianity and gave rise to his wish to become a missionary himself. To obtain the necessary training he applied for admission to the seminary of the Basle Mission Society in Switzerland; when he was accepted, he became the first baptised Jew to enter the mission seminary. At the completion of his studies, he graduated and was ordained in 1862. Herlitz’s graduation and his waiting to be assigned to a mission field, coincided with a request made from Australia by the Evangelical Lutheran Synod of Victoria. It was looking for a minister to fill the pastoral vacancy in the Lutheran congregation at Germantown, now Grovedale, near Geelong. The position was offered to Herlitz and he accepted. He served at Germantown from 1863 to 1868, followed by the call to East Melbourne to become the minister of Trinity German Lutheran Church after the resignation of the incumbent, Pastor Matthias Goethe. For the next forty-six years, from 1868 to 1914, he combined the duties of ministering to the congregation at East Melbourne and several congregations in outlying areas, with the office of President of the Victoria Synod. From 1876 he held also the presidency of the General Synod. In addition, he was editor of the synodal monthly Der Australische Christenbote / The Australian Christian Messenger, a position he vacated in 1910. Throughout his tenure as president of the Victorian Synod, Herlitz made a union of all Lutheran synods in this country his cherished aim and he worked assiduously to bring this to fruition. The obstacles were huge, and a lesser man would have given up in resignation. Herlitz, however, persevered undeterred. Travelling widely to promote his vision and using the publication of the church’s monthly as a medium to reinforce his stand and to refute the arguments of his opponents, he was able to bring about the consent initially at least of two and later of three regional synods to form the Evangelical Lutheran General Synod in Australia in 1876. To Herlitz, the Lutheran Church had its place in a broader Protestant environment. In his person, he combined faithfulness to the Lutheran Confessions with ecumenical openness. This led him to play an active role in a wide range of ecumenical and charitable organisations on top of his many duties within his own church. Over the years, he was active in the Victorian Council of Churches, the Hospital Sunday Fund, the Immigrant and City Mission, the Foreign Missions Committee of the Federated Presbyterian Churches of Australia and Tasmania, the Charity Organisation Society and the Austin Hospital Committee. 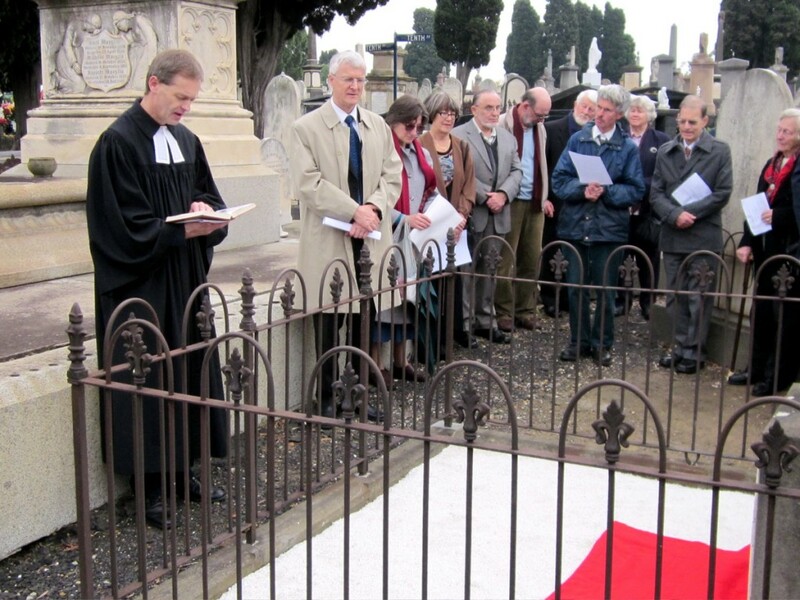 He lent support to the Moravian missionaries working among Victoria’s Aboriginal population on behalf of the Presbyterian and the Anglican Churches. All this contributed to his growing reputation within the wider community. It was a measure of his public trust that when the utopian Christian socialist commune called Herrnhut near Hamilton in western Victoria got into financial difficulties in the mid 1880s, the judicial authorities appointed Herlitz to draw up a scheme of management to resolve the commune’s problems. Pastor Greg Pietsch, the Victoria/Tasmania District President and, as the representative of the Lutheran Church of Australia, extended greetings and referred to the pioneering nature of the work of Pastor Herlitz. Mr David Weatherill, Deputy Chair, Cemeteries Committee, extended greetings from the National Trust and complimented the congregation for their planning and work in relation to the restoration of this grave. The dedication of the plaque was then conducted by Pastor Matthias Kunze. Psalm 121 was read, the hymn “Now thank we all our God” was sung and the covering over the plaque was removed. The headstone on the restored grave records the burial of Pastor Hermann Herlitz, who died on 9 June 1920 aged 86 years, of his wife Minnie nee Feldmann, who died on 19 Sept 1917 aged 74 years and of Katie, who was born on 9 July 1867 and who died on 1 Feb 1875. 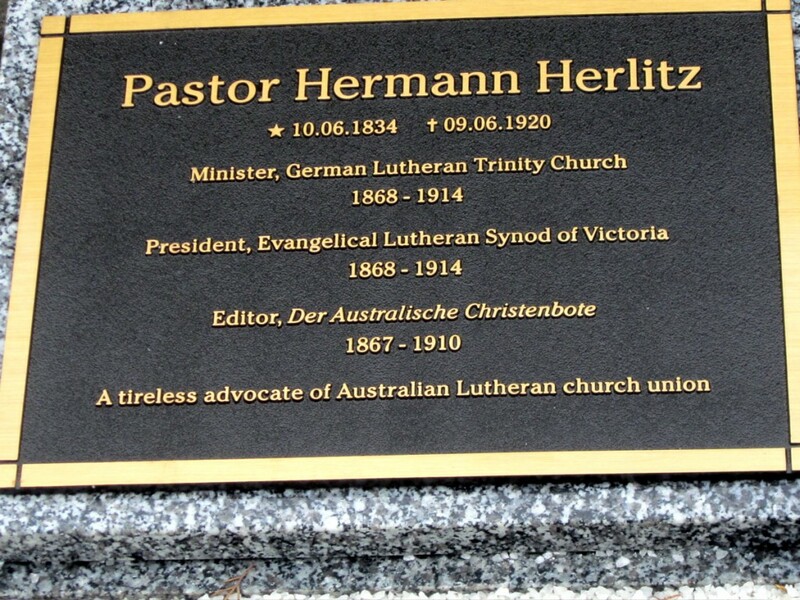 The words on the plaque read: “Pastor Hermann Herlitz, 10.06.1834 – 9.06.1920; Minister, German Lutheran Trinity Church 1868-1914; President Evangelical Lutheran Synod of Victoria 1868-1914; Editor, Der Australische Christenbote 1867 – 1910; A tireless advocate of Australian Lutheran Church Union”. Finally, the behind-the-scenes work of AKi member Renate Jurgens in preparing the artwork, printing and mailing out the invitations and in setting up of the programs is gratefully acknowledged.